Nearly £1billion worth of energy is wasted in UK homes each year just by leaving appliances on standby. * But now One For All, the home electronics experts, have introduced the NEW 'Energy Saver' universal remote control that switches off all your a/v equipment at the press of a button for a greener environment. 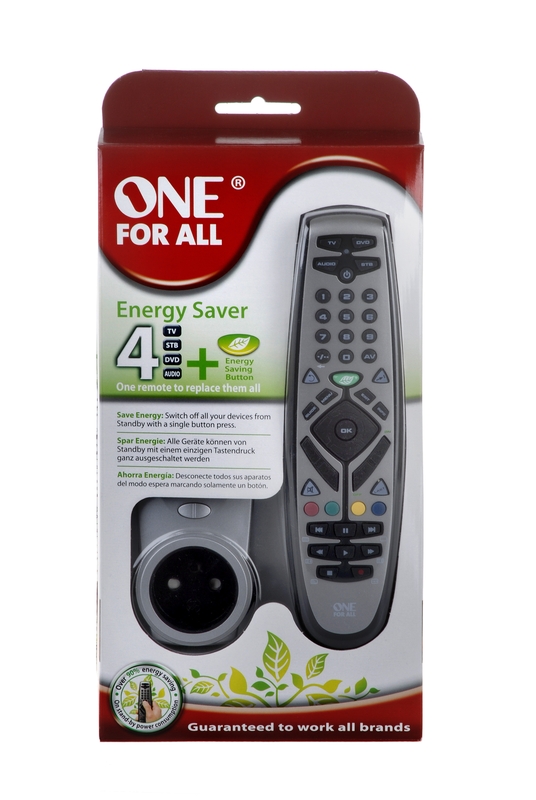 Easy to set up and simple to use, the Energy Saver remote from One For All is an excellent way to cut energy bills and go green. Simply insert the Power Plug into the wall socket, then connect up to four devices including your TV, DVD and satellite/cable digibox. The One For All Energy Saver remote comes pre-programmed to control the Power Plug, so you just press the special energy-saving green button on the remote to make an energy saving of 90%. A typical set of a/v equipment uses 9.7 Watts an hour if left on standby but by using the 'Energy Saver', this can be cut down to 0.9 Watts! Research shows** that a TV LCD consumes 1.5 Watts per hour in standby mode, a total of 11.49 Kilowatts per year on standby assuming the TV is in use three hours a day. A satellite receiver uses 6 Watts an hour or 45.99 Kilowatts annually. And a DVD recorder consumes 2.2 Watts per hour totalling 16.86 Kilowatts a year on standby. So, with the One For All 'Energy Saver', it's easy to save up to 74.34 Kilowatts a year or 44 Kg of carbon dioxide. And you can relax when you go to bed knowing that by switching off all your devices left on standby, there will be less risk of a fire. The One For All Energy Saver remote control is available from the end of May in major stockists including Dixons online and John Lewis - then Asda, Argos and Tesco from August. The Energy Saver remote can control up to four devices including TV (Plasma, LCD and projector), DVD player/recorder, Satellite, Cable and Terrestrial Digital Video Broadcasting and Surround Sound Audio. It can also control lights in the home as the remote supports the One For All Light Control and is expandable with other One For All Power Plugs. Guaranteed to work with almost every AV appliance, it works with over 1300 brands and is future proof because it can be wirelessly upgraded with any new device code over the internet. With the Learning feature, every function required is on the remote control. It allows the user to copy any function from their original remote control onto the keypad of the Energy Saver. Thanks to the macro key, multiple commands can be sent by pressing just one single button. Some TV, DVD, Satellite receiver or Cable converter functions can be used at the same time. The remote works with 2 AAA batteries with a battery life of over 9 months. With 20 years experience in wireless control technology, One for All's parent company, Universal Electronics Inc. is the global market leader in wireless control software and technology. It is the global leader in Retail Universal Remote Controls under the One for All brand and in providing intelligent handheld devices for the Cable & Satellite industry. This press release was distributed by ResponseSource Press Release Wire on behalf of Starfish Communications in the following categories: Men's Interest, Entertainment & Arts, Leisure & Hobbies, Home & Garden, Women's Interest & Beauty, Environment & Nature, Consumer Technology, for more information visit https://pressreleasewire.responsesource.com/about.